Living each day with faith and trust that I'll make it to the end, with a little Disney Pixie Dust thrown in! Uh, no. Here we are with less than 60 hours to wheels up, and I honestly have practically nothing done. This is very unlike me, and I am trying not to go off the edge with stressing about what yet needs to be done. I guess, realistically I could be laundering and packing RIGHT NOW. But, I'm not. You'd think after 9 years of working as a night shift nurse, I wouldn't even need sleep anymore, but alas, this is not true. After working on a night, off a night, for what seems like 2 weeks, I'm a sleep deprived mess. So I am finishing one last post before the trip, gonna hit the hay early, and will make tomorrow a marathon preparation day! But before tomorrow's long day of laundry, packing and the obligatory mani/pedi, I thought I'd give a little preview of our well planned trip. I may not be well packed, but I am always well planned. Getting up at 6am, 180 days in advance well planned. The cast of this 8 night tour includes myself, DH, and DS's ages 8, 6, and 4. To make it even more fun we are traveling with our good friends, @rnawaymama, her DH, their 5 children ages 11 to 4 months, and @rnawaymama's parents Nana and Poppy. This brings us to a grand total of 14! We are having our own Disney vacation "pre-show" of course, with a trip to see the 3D version of The Lion King on Friday night. Saturday we have flights out with a planned arrival at Bay Lake Tower around 2pm. We have a 1br Lake View Villa booked with our DVC points for 8 nights. Planned highlights of our trip include our first stay at Bay Lake Tower, checking out the newly revamped Star Tours attraction (probably multiple times considering ALL the kids love Star Wars), our first time dining at Mama Melrose's, Ohana's, and 1900 Park Fare, the Epcot Food and Wine Festival, Mickey's Halloween 5K, and hopefully a surprise or two! The number 40 seems to come up a lot for us on this trip, as one member of our party will be turning 40 during our trip, Walt Disney World itself will turn 40 on October 1st, (we plan to be at the Magic Kingdom to celebrate), and my youngest DS who is 4, will be enjoying his first ever trip to Disney where he will make the 40 inch hight requirement! Additionally, on the Moms Panel front, @rnwawaymama and myself have RSVP'd to attend a Moms Panel Meet and Greet at the Yacht Club on the 1st. We've yet to receive the final confirmation that we can attend, but we are quite hopeful that we will be able to go and meet current panelists, as well as other hopefuls such as ourselves from the DisBoards! I think reporting on this event in itself will require an entire post! Stay tuned for a full trip report when we return, or you can follow me at twitter @dizkrazkate or my fellow Moms Panel hopeful and former guest blogger @rnawaymama for real time updates and pics! Becoming Part of the Magic. Let the Nail Biting Begin! Can't you just see the name "Kate" on the Back of those mouse ears? That time of year has come around again. The time where Disney World fanatics around the world work themselves into a tizzy of nerves and excitement. It's Disney Moms Panel Application Week! This week marks the 5th year that Disney has opened the worldwide search for their elite Moms (and dads, and I think one aunt) Panel. The process opened on Monday the 12th, and will run until Friday night the 16th, or when the limit of applicants has been reached. In the past, the number 20,000 has been thrown around as the maximum number of applications accepted, but this year's exact number is unknown. Unlike in prior years, this year they are specifically looking for moms and dads to apply to represent not just Walt Disney World, but also Disneyland, runDisney, Adventures by Disney, Disney Cruise Line, and Disney Vacation Club (DVC). They are apparently, only accepting so many applications for each of these catagories. Let me assure you, that on Sunday night, I was already getting quite nervous about what questions would be waiting for me in the morning. The application consists of just a few questions, and those questions are limited to no more than 100 words. And there is no cheating on that one. If you type in more than 100 words, it will only submit the first 100, and the rest of your answer WILL be cut off. Each year the questions are different, but the idea is the same, make yourself stand out above 10,000+ other applicants in only 200-300 words. "Gawrsh Mickey! Only 200 Words!" This year you were asked a simple true or false question, followed by 2 short answer questions. The first question wanted you to state your favorite resort, and why it was so. The second question wanted to know what resources you use to help friends plan their vacations, as well as learn new information and trivia for yourself. I was hoping that I could apply to be either a Walt Disney World Mom, or a Disney Vacation Club Mom, but unfortunatly, the application would only allow you to apply for one. I gave strong consideration to the Disney Vacation Club(DVC) spot, but decided to go for the general Walt Disney World catagory. Although we are very happy DVC owners, we have only stayed at 3 different DVC properties, and I have yet to use our points for a Disney Cruise or traded our points through RCI. On the other hand, I am currently packing for lucky number trip 13 to Walt Disney World, and my 14th visit is already booked for this winter. I have traveled to Walt Disney World on family trips as a kid, on Magic Music Days trips as a teen going with friends, a mother-daughter only trip in my 20's, family trips as a mom, as well as trips with extended family and friends. And so I decided my overall expertise was more applicable to a general WDW Mom, rather than as a DVC Mom. A Little Pixie Dust Please! For now, I have nothing to do but wait for the Round 2 notifications to come out. Although Disney says they will not be able to recognize everyone that did not make the panel, in past years they have sent out a polite "than you for applying, but..." type of email. I was truly shocked to not receive that email last year, but instead was told I was moving on to Round 2. I scared the mouse ears off my husband by literally screaming in bed as I read the email. I know that if chosen, I would be "Fantasmic" at helping people plan their ideal Disney vacation, but getting that across in so few words is a challenge. I have no idea what part of my application made them decide to give me a chance, but let's hope I was able to show some of that magic in this year's answers, and be chosen for one of those prized pixie dusted positions! So send as much pixie dust as you can find this way everyone! And I will update the blog as the process continues. 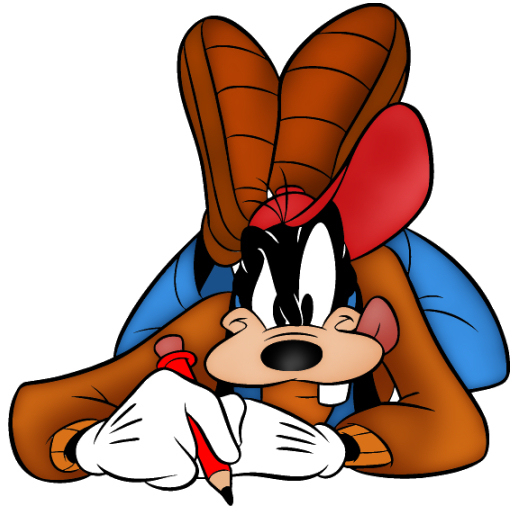 This blog entry is the third installment of my planning page "Disney Planning and Touring How To Guide". I will be posting a little bit at a time to the home page. If you'd like to read the touring page in its entirety now you can click here to view it. Once you are getting closer to your actual trip, you can work on a touring plan for each day. Just like scheduling what park you are going to for the day and having ADR's prevents the old "Where are we going today?" and "Where should we eat?" debate, having a touring plan prevents having an entire family huddled around a park map deciding "What should we do next?". There are several ways to make or get a touring plan for each park. You could look at a Disney guide book and park map and decide on your own which attractions you would like to take in, and in which order. I would not recommend this unless you are an experienced WDW traveler. My best recommendation is to use TouringPlans.com's tour plans. This website was born out of "The Unofficial Guide To Walt Disney World" books. I really feel they are the best guide books out there for Disney. If you're only going to buy one, this is that one. See it here on Amazon. I personally have used and always recommend these touring plans. The first year we went with kids, I decided to use their guide for families with small children. My family thought it was a little nuts to have the day so scheduled, but it WORKED! My family thought me a genius! It used to be that you were mostly limited to the several touring plans located in the back of the book, but now with their website, there are many many more plans. You're bound to find one that fits your family. TouringPlans.com's plans are well thought out and well researched by their own in-park teams to figure out the best way to see the most of the parks in the least amount of time. That first morning in Magic Kingdom, without EMH, we were able to see the opening show, then rode: Dumbo, Carousel, Peter Pan x2, Small World, Haunted Mansion, Mickey's Philharmagic, have an ice cream break, Winnie the Pooh, the Teacups, the Barnstormer x2, AND ride the train to the front gate all by 11:45. And this was in the summer! Screenviews on TouringPlans.com's app "Lines"
I won't re-post their plans here, as they belong to them, but the small $11-$12 subscription is well worth it. I do believe they have a free touring plan for each park available on the site. Choose which plan appears to be best for your family, and print it out. If something on the list is not appealing to you, just skip it and move to the next attraction on the list. Now, don't turn into a drill sergeant with those plans, but use them as a guide. You will save time just by having a plan, and their plans in particular are designed to save you time based on when certain rides have the longest or shortest waits. If you do not want a subscription, but are interested in their plans, you can almost always find a copy of "The Unofficial Guide to Walt Disney World" at the library. You can download their app "Lines" for free, and as long as you have a subscription to the website, you can login to the app, and get all that handy information on the go! Plus it gives you current wait-times for rides, and FastPass return times. Before you hike across the park to get FastPasses you can see if there are even any left! Rope Drop (RD) is the moment that Disney literally "drops the rope" and lets everyone into the park for the day. Yes, they actually do drop a rope! (okay, maybe they don't "drop" it, but there is a rope) Making Rope Drop means you are there when the drop happens, and are one of the first people let into the park. To really get the most out of your time at Disney, you must make Rope Drop. Do you need to be the person AT the rope? No, of course not, but you should be part of the crowd behind those folks. You can accomplish in that first hour, what will take most people 2 to 3 hours to do in the mid-afternoon. RD is the least busy time of day. Do not sleep in, you can go back for a nap later! At the Magic Kingdom, there is an opening ceremony where Mickey arrives on the train, and everyone counts down from 10 to open the park with the "Family of the Day". Instead of the crowds of 20,000 to 50,000 that will share the park at 3pm, there may only be a couple hundred to thousand at opening. If you'd like to watch the opening show below, pause this blog's soundtrack prior to playing the video. There is also an opening "show" at Animal Kingdom, and a little countdown at Epcot. Hollywood Studios also has a little coundown, and then honestly it is slight chaos as everyone chooses Toy Story Mania or Star Tours as their starting point. Rope Drop is the ideal time to pick your top two rides and get a Fastpass for one and ride the other! 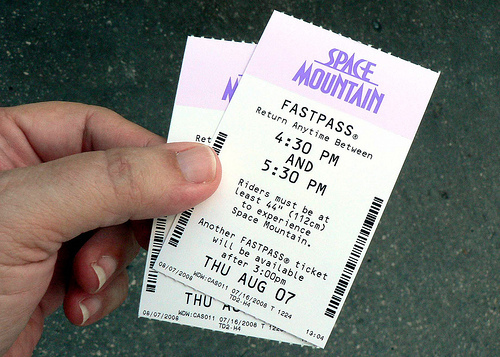 Once a ticket has passed through the turnstiles, it can be used to get a FastPass for select rides. What I suggest is having one family member be the "FastPass runner", and be responsible for all park tickets in the group. (Please don't actually run!) That person can then go by themselves to the FastPass ride kiosk to get the passes for the entire group. Then the runner can rejoin the group at a pre-determined attraction. While at the FastPass Distribution Kiosk, you put your park ticket or KTTW card if your tickets are on there, into the FastPass machine. It will drawn in and read the ticket, then spit it back out. This is to make sure you don't forget your ticket! Pull out your ticket, and then the machine will spit out your FastPass into the slot below! Your Fastpass will have a return window of which you are to return to ride the ride. That time may be in an hour, or 8 hours, as they are distributed on a first come first serve basis. It will also have printed in small letters at the bottom, when you can get a subsequent FastPass. Usually that time is in 2 hours, or the time at which you can use the FastPass, whichever comes first. Now, the following is a source of debate. Although Disney will strictly enforce the return time on the pass, until recently they did not enforce the expiration time on the pass. Some feel this it is wrong to return after the window, others feel it is not a big deal. Since I have personally heard two Cast Members at a FastPass return line shouting to the crowd that it is okay to return after their FastPass time has officially expired, I felt it was okay. However it has been reported that changes are coming to Disney involving Next Gen technology. In preparation for this new system, Disney is now instructing Cast Members not to tell guests they can return after the pass has expired. It appears as of this date, they are still not stopping people from using them after the expiration time, but they will if it is very crowded. At this point it is up to you to decide if it is worth the risk or not. We may try it during our upcoming trip and I will report back. I'm not sure entirely what this "Next Gen[eration]" techology entails, but I suspect Fastpasses may become available for Resort Guests only, or perhaps Resort Guests can make a reservation or sorts for a certain number of Fastpasses per day. Here is a quickie video on using the machines. Don't forget to pause this blog's soundtrack at the bottom of the page. Take a Break. Take a Break! Take a BREAK! Disney can be an overwhelming place with lots of people, lights and noise. Even for an obsessed Disney person like me, it can be sensory overload. I highly recommend if you are staying more than 2 days in the parks, that you incorporate a mid-day break. This is probably one of the single best pieces of advice I can give. The only exception to this is a day at Animal Kingdom. Since the park closes early, this is the only day I don't recommend leaving and coming back later. Ideally you are staying on property, and can take a quick bus ride back to your resort. Nap, swim, do both, whatever, just get out of the parks for a few hours. If you have small children, or even elementary school kids, a nap is a good idea. While none of my boys nap at home, all are required to nap at Disney. Honestly, they are so tired from getting up early and going all day, staying up late for fireworks, they all seem to nap just fine! You can either grab lunch in the park, and then head back to your resort, or grab a quick lunch at your resort before your swim/nap time. Then return to the park in the late afternoon/early evening. We are usually out of the park by noon, and returning around 4 or 4:30pm. If you are adults who don't or can't leave the parks easy, or a family with kids who just needs a break, you can try to find some down time nearby. Ideally you'd like to find some air conditioning, and a place to sit, escape the crowded parks, and just get a break from the overstimulating place that Disney can be. The Magic Kingdom has the best places to get a quick rest. Get on the Walt Disney World Railroad. Just stay on and ride around as many times as you need. Its cool and much quieter than the rest of the park. Ride the Tomorrowland Peoplemover. It is a slow and cool ride, and often it is not very busy and the Cast Members will allow you to stay on board. You can leave the park entirely and ride the Monorail. It is also cool and quiet. You can ride to Epcot and back or the Resort Monorail Loop as much as you would like. If you would like to get off, you can explore some of the hotels on the loop, either the Contemporary, Grand Floridian, or Polynesian. You can also jump on the Monorail to the Magic Kingdom, and ride back and forth as much as you would like. At Epcot, the Monorail actually goes through the park! You could exit Epcot via the International Gateway (between Great Britain and France) and walk to either the Boardwalk, Beach Club, or Yacht Club resorts and wander, or just find a bench to sit down and rest. The American Adventure is a 25 minute animatronic stage show that is cool and dark, several of my family members have fallen asleep during this show. It really is a very moving show, and I highly recommend experiencing it, even if some members of your family are not up for the history lesson. This park is a little more difficult to find peace and quiet. If you can't return to your resort, you can take the long walking path to the Yacht and Beach Clubs, or board a Friendship Boat to the Beach Club or Boardwalk. Usually I think it is better to just push through the day and leave around 3 or 4 o'clock for a restful late afternoon and evening. If you really need a break, first consider the Finding Nemo Musical. It is inside and air conditioned, and it lasts around 45 minutes. If this is not an option, you could always bus over to Animal Kingdom Lodge and explore the resort and animal viewing areas, or sit down in the large lobby and take a rest. Coming soon, the fourth and final installment of this page "Do You Have Your Exit Buddy?". 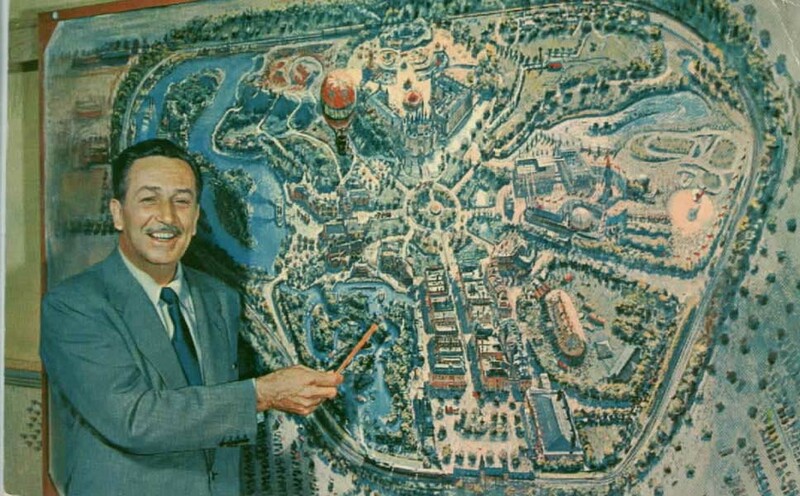 This blog entry is the second installment of my planning page "Disney Planning and Touring How To Guide". I will be posting a little bit at a time to the home page. If you'd like to read the touring page in its entirety now you can click here to view it. Disney generally releases its park hours 6 to 6 1/2 months ahead of time. Once park hours are posted, you are ready to start your planning! If park hours are not released yet, you can look at the previous months' hours as a guideline for what the park hours may be while you are there. The Mouse himself during Fantasmic! The best place to begin choosing a park for each day is whether or not you have Park Hopper. If you have the Park Hopper option you can visit one park in the morning and another in the afternoon. If you have skipped the Park Hopper option, you need to pick the number one most important park for each day. Start with planning your day for Hollywood Studios based on Fantasmic. During most of the year, Fantasmic is only offered on certain nights, generally Sundays and Thursdays. Sometimes during busy seasons they will offer it on more nights, or twice per night. If it is only offered on Sundays and Thursdays, one of those nights will need to be your Fantasmic night if you wish to see it. If you are not going to view it, avoid Hollywood Studios at all cost on those nights. If there are two shows available in a single night, the later show will be less crowded. Look at the Extra Magic Hours (EMH). If you are off-property, you should not go to a park that is having either morning or evening EMH that day. Choose a park with NO Extra Magic Hours. If you are on property, choose the park with morning EMH. Yes, I know getting up early does not sound like vacation, but you can get more done in that first hour than you can get done between 12 and 3 pm. Evening EMH can be tricky. For the Magic Kingdom especially, I think it can be even more crowded. Stick with morning EMH, and try to stay away from evening EMH, especially at MK. 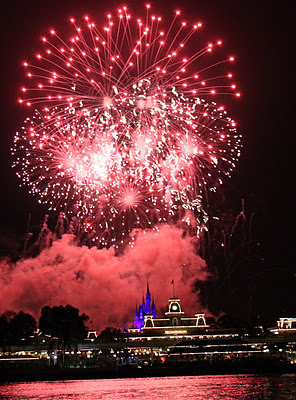 Watch out for nights that a park, especially Magic Kingdom, closes early. This is often because of an after hours party like the Halloween or Christmas party. Avoid Magic Kingdom on those days unless you are attending the party. Also, Magic Kingdom does not offer both the parade and fireworks on every evening during slower times. If you want to see both, take that into account while planning. Animal Kingdom closes early. Generally 5pm or 7pm. This allows for a shorter touring day, and you can have a quieter night. This may be good to schedule in the middle if plans allow to get a mid-week rest. Finally, consider that subscription to TouringPlans.com. While it usually posts the crowd estimates for the upcoming few weeks for public use, a subscription will give you access to a year's worth of crowd estimates. It will rate the estimated crowds for a day on a scale from 1 to 10, and it will also recommend the best and worst parks to visit on any given day. If, for example, you are deciding between Animal Kingdom or Epcot on a certain day of your schedule, TouringPlans.com may recommend one over the other. Now, will you be able to make a schedule that follows ALL of the above guidelines? Probably not. But it will help you decide which parks might work better for your family on any given day. It's not supposed to be perfect, just better than going without a plan. 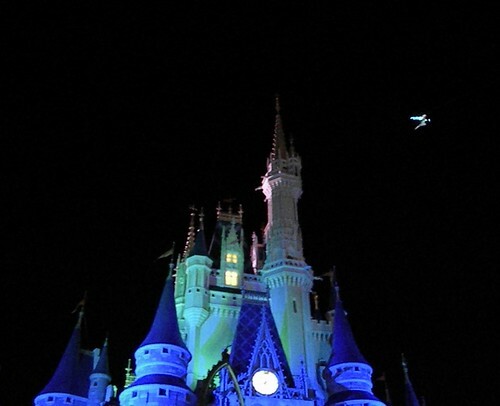 You don't want to show up at the Magic Kingdom on your only day there, to find out the park closes at 7pm and there are no fireworks after you promised your Tinkerbell obsessed 4 year old she would get to see Tink fly. Now that you know which park you will be in or near on each day of your trip, its time to plan your dining for each day. If you will not be eating at any table service restaurants, and will be eating at your resort, room or off-site, you do not need to worry about this. If you do plan on eating a sit down meal on property, you should make Advance Dining Reservations (ADR's or "ressies") as soon as possible. Most can easily be canceled, so its better to at least make some kind of reservation that fits your plan, rather than waiting. If waiting for family who says "I don't know, let us think about it", is going to make you not get a ressie at Chef Mickey's or Ohana's, just make ressies and you can change it later! Certain places are very popular, and fill up very quickly, and Le Cellier, or the Fantasmic Dining Package may be totally booked exactly 180 days in advance. I always call or get on the computer at opening exactly 180 days in advance and I have NEVER been able to book that elusive Fantasmic Dining Package! If you are more than 180 days out, I recommend getting up and loading Disney's Dining Reservation Page at 0600 Florida time on the 180 day mark to get the places and times you really want. I have heard stories of people writing scathing reviews of how much they hate Disney World because they promised their granddaughter she could eat with Cinderella, and then when she showed up at the castle expecting to eat she was told they were booked. Disney ruined their granddaughter's dream. I'm sorry, but that's not Disney's fault. Dear Husband at Halloween Time with Chef Mickey! If you are relying on Disney Transportation during your stay, be cautious about making ADR's at resorts other than your own. It can be very time consuming to travel from one resort to another, and it might take up too much of your time, or be a big hassle to change buses with kids. If you really want to eat somewhere at another resort, keep travel time and your daily location in mind. If for example you would like to hit the buffet at Cape May Cafe at the Beach Club Resort, plan this for a dinner on the day you are visiting Epcot. If you are going to Chef Mickey's at The Contemporary for breakfast, or 1900 Park Fare at The Grand Floridian for dinner, plan this for a day you will be vising the Magic Kingdom. You may also consider the cost of a Taxi for early morning breakfasts at other resorts. The cost will be around $25, and it may be worth the time savings. Or just make life easy and make all your ressies within the park you will be visiting, or your own resort! At this point you should have a plan of which park you will visit each morning and afternoon, your evening entertainment if any, and your sit down meal for the day. Here is a copy of my spreadsheet I used for our trip in August 2010. Wed. Thurs. Fri. Sat. Sun. Mon. Tues.
Poolside movie at Kidani 8pm! ** To choose which park for each day- Find what nights Fantasmic is showing, make that a Hollywood Studios evening. Use Extra Magic Hours morning hours as much as possible. If there are still multiple good choices for each day, consult Touringplans.com for best/worst parks ratings. It can be a lot of information, and you can copy the above if you like, or create your own method. For an easy way of keeping track, you can buy a PassPorter book. You can also get one from Amazon. It is a great tour guide with pull out maps, and full color photos. In the back are their famous PassPorter pockets where you can record and store information such as plans and ressie numbers for each day of your vacation. I highly recommend it. Listen and Read Great Disney Advice! A Purse Fit for a Princess: New Dooney and Bourke Design for the 2014 Disney Princess Half Marathon! Read More in My Blog Posts! We Want to go to Disney. Where do we begin? What is the Disney Dining Plan? Should we get it? I'm a self proclaimed Disney Mom to three young pirates, and one little princess. During the day, I am a full time mommy. By night I am an RN on a labor and delivery unit welcoming future Mouseketeers into our magical world. 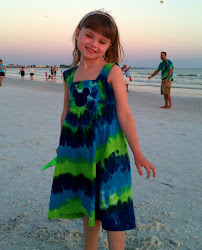 I am a go-to-gal for planning a Disney vacation, and I love helping families plan their trips. Walt Disney World is my favorite place to vacation, and I love it so much, I want everyone else to love it too! I am a firm believer that a little advanced planning can make any vacation into a magical one. 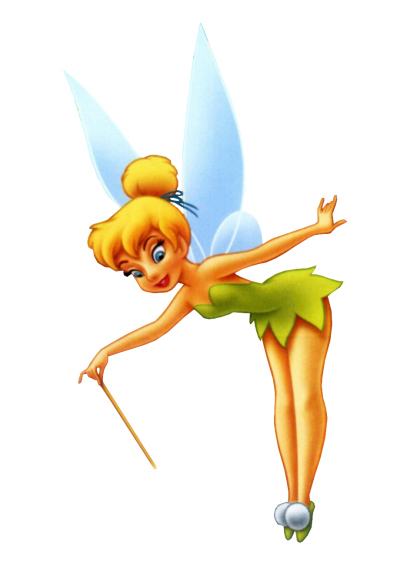 All it takes is "Faith, Trust and a Little Pixie Dust"! I decided to put my vacation advice into one place for my friends and family to find, and so this blog was born! This way friends and friends of friends, can have a quick and easy way to find the vacation planning websites I recommend, helpful hints, and basic WDW know-how. I will also post TR's (Trip Reports) from some of our family vacations. Feel free to email me at dizkrazkate@gmail.com or post comments or questions and I will get you an answer! Thanks for reading my blog! ZannaLand | Delivering Pixie Dust Daily!